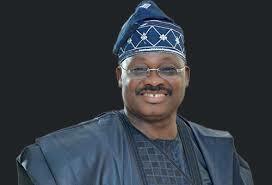 Not many people are aware that the recent crisis that rocked Oyo State APC over the imposition of care taker chairmen on Local Government Areas by the state Governor, Senator Abiola Ajimobi has been predicted since January 2017. The grievances took a new dimension on Monday 3rd of 2017 as some politicians and members of the state’s All Progressive Party (APC) fought dirty at the state’s secretariat in Ibadan. 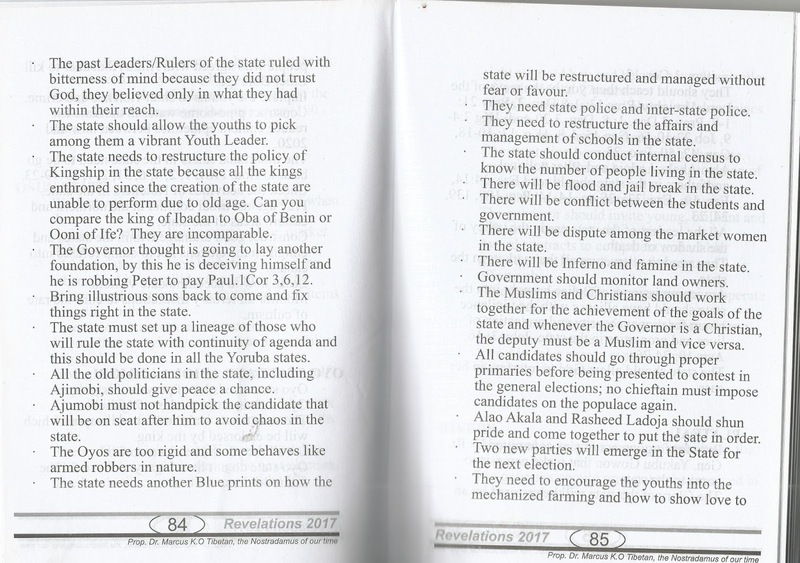 However, both the LGA clash and the various clashes between Governor Ajimobi and students of various institutions in the state has been predicted in a book “Revelation 2017”by renowned seer, Prophet (Dr.)MKO Tibetan of Celestial Church of Christ, Elisha Parish (Dublin & Nigeria) since January7, 2017 when the book was launched in Lagos. 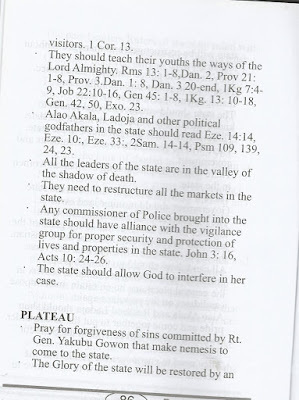 The Prophet warned the governor who recently used disparaging words on students of Ladoke Akintola University during a protest to his office on page 84 of the book to give peace a chance’ in Oyo state but it seems either the governor who loves to address himself as 'Constituted Authority' didn’t get a copy of the book or he got it but decided to test the importance of the message. 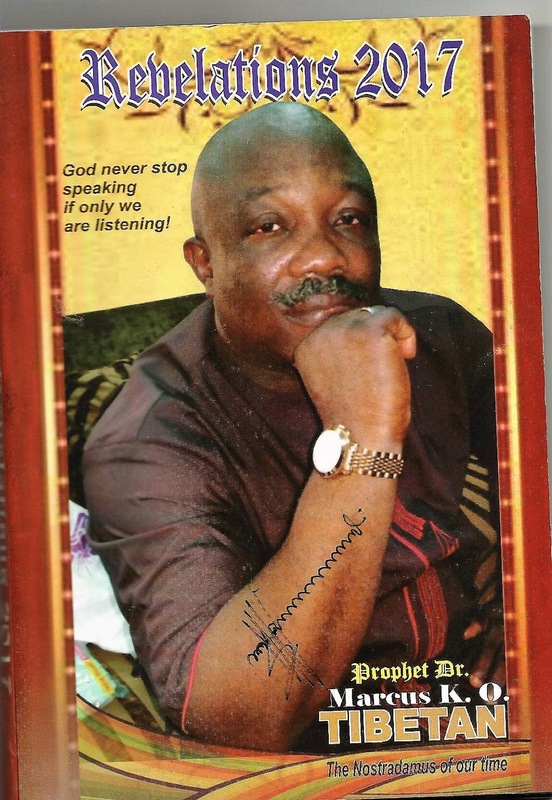 On page 85 of the book Prophet Tibetan practically warned Governor Ajimobi not to handpick any candidate to lead in any political office as this might lead to danger. 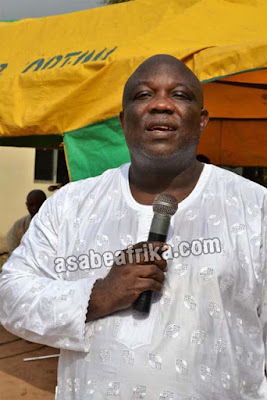 Hear him “All candidates should go through proper primaries before being presented to contest in the general elections; no chieftain must impose candidates on the populace again”. The Prophet said more in the following report. Find out. 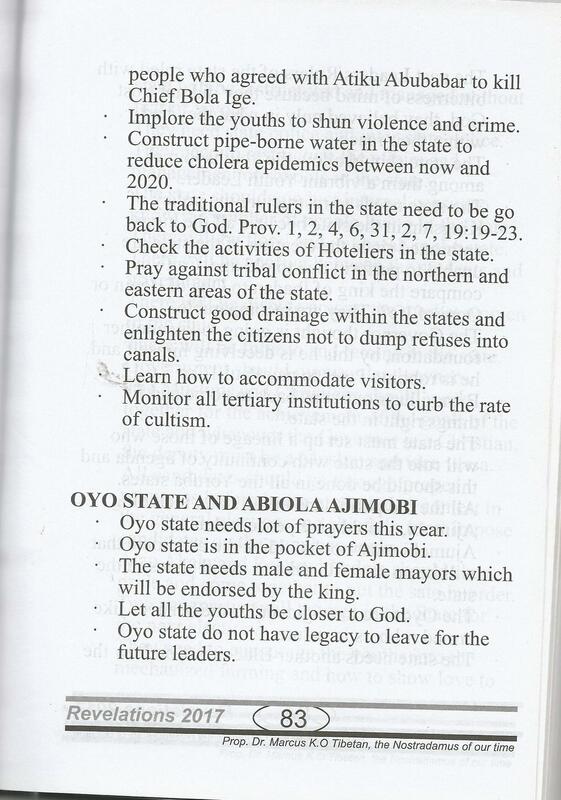 · Oyo state needs lot of prayers this year. 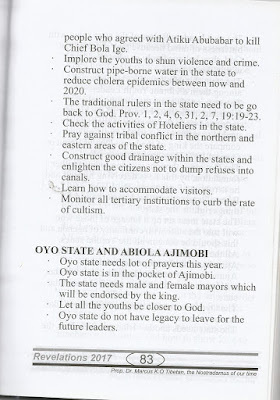 · Oyo state is in the pocket of Ajimobi. · The state needs male and female mayors which will be endorsed by the king. · Let all the youths be closer to God. 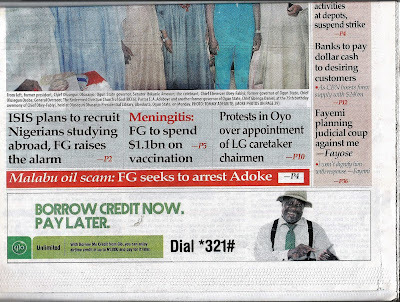 · Oyo state do not have legacy to leave for the future leaders. · The past Leaders/Rulers of the state ruled with bitterness of mind because they did not trust God, they believed only in what they had within their reach. · The state should allow the youths to pick among them a vibrant Youth Leader. · The state needs to restructure the policy of Kingship in the state because all the kings enthroned since the creation of the state are unable to perform due to old age. Can you compare the king of Ibadan to Oba of Benin or Ooni of Ife? They are incomparable. · The Governor thought is going to lay another foundation, by this he is deceiving himself and he is robbing Peter to pay Paul.1Cor 3,6,12. · Bring illustrious sons back to come and fix things right in the state. · The state must set up a lineage of those who will rule the state with continuity of agenda and this should be done in all the Yoruba states. 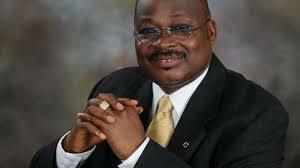 · All the old politicians in the state, including Ajimobi, should give peace a chance. · Ajumobi must not handpick the candidate that will be on seat after him to avoid chaos in the state. · The Oyos are too rigid and some behave like armed robbers in nature. 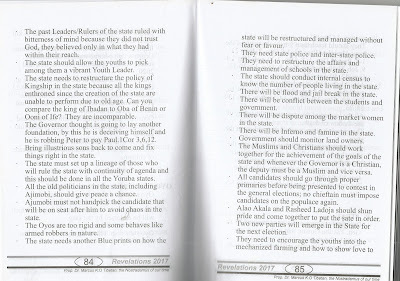 · The state needs another Blue prints on how the state will be restructured and managed without fear or favour. · They need state police and inter-state police.  · They need to restructure the affairs and management of schools in the state. · The state should conduct internal census to know the number of people living in the state. · There will be flood and jail break in the state. · There will be conflict between the students and government. · There will be dispute among the market women in the state. · There will be Inferno and famine in the state. · Government should monitor land owners. · The Muslims and Christians should work together for the achievement of the goals of the state and whenever the Governor is a Christian, the deputy must be a Muslim and vice versa. · All candidates should go through proper primaries before being presented to contest in the general elections; no chieftain must impose candidates on the populace again. · Alao Akala and Rasheed Ladoja should shun pride and come together to put the sate in order. · Two new parties will emerge in the State for the next election. · They need to encourage the youths into the mechanized farming and how to show love to visitors. 1 Cor. 13. · They should teach their youths the ways of the Lord Almighty. 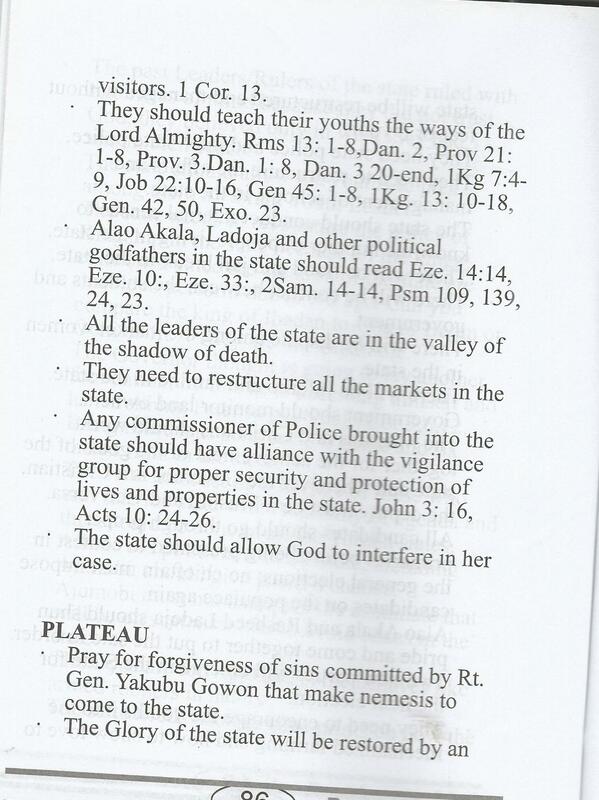 Rms 13: 1-8,Dan. 2, Prov 21: 1-8, Prov. 3.Dan. 1: 8, Dan. 3 20-end, 1Kg 7:4-9, Job 22:10-16, Gen 45: 1-8, 1Kg. 13: 10-18, Gen. 42, 50, Exo. 23. 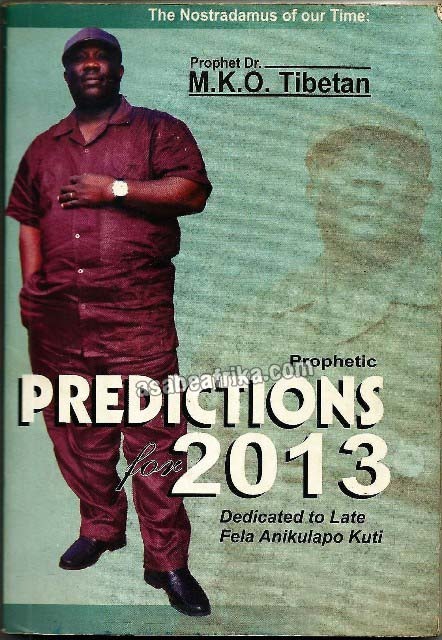 · Alao Akala, Ladoja and other political godfathers in the state should read Eze. 14:14, Eze. 10:, Eze. 33:, 2Sam. 14-14, Psm 109, 139, 24, 23. · All the leaders of the state are in the valley of the shadow of death. 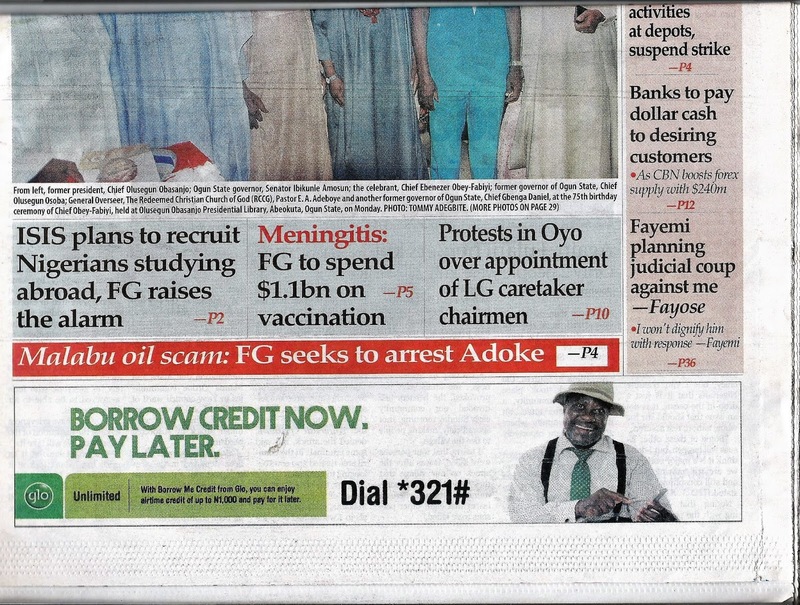 · They need to restructure all the markets in the state. 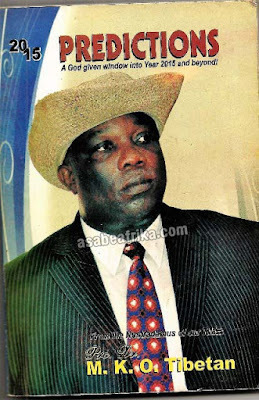 · Any commissioner of Police brought into the state should have alliance with the vigilante group for proper security and protection of lives and properties in the state. John 3: 16, Acts 10: 24-26. 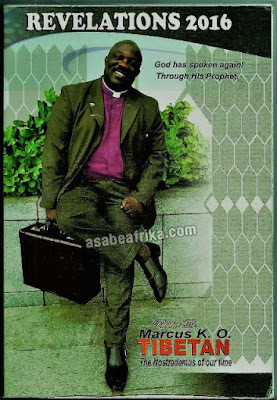 · The state should allow God to interfere in her case.